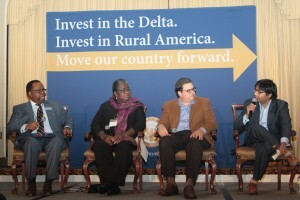 The Delta Regional Authority, in partnership with the White House Rural Council and U.S. Department of Agriculture, hosted a Rural Opportunity Investment conference in Memphis, Tennessee on January 11-12, 2016. Top leaders from the business community and financial institutions, senior government officials, rural economic development experts and others from across the Delta region gathered to discuss potential partnerships between public, private, and non-profit entities that will invest in job creation, small business growth, and the development of important rural infrastructure. MuniStrategies co-founder and Managing Member Alan Lange spoke on a panel on impact investing with moderator Darrin Williams, CEO of Southern Bancorp; Donna Gambrell, former Director of CDFI; and Sanjeev Krishnan, Managing Director of S2G Ventures. To view pictures from the event, visit DRA’s Flickr Album.